In the lineage of Sun Ra, Fela and other unclassifiable artists, a musician from Beograd constructs his own sonic universe, rooted in the rhythms of Africa and branching out into future jazz. 7 tracks, no pigeonholes. 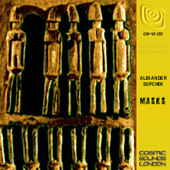 Produced, arranged, composed and performed by Alexander Sopchek. Inspired by Fela, Sun Ra, DJ Shadow and pygmy melodies, Alexander Sopchek forges a new sound for a borderless future. The realization of a musical dream over 20 years in the making, MASKS arrives ahead of its time. Who'd have thought that the deepest African record in recent memory would arise from the Belgrade (as in Serbia) suburbs? Sopchek hacks through preconceived musical notions like a machete through the jungle underbrush, clearing new paths of sonic discovery. From the opening murmurs of "Destiny Dawn", MASKS builds into a hypnotrance soul vamp. African roots rhythms propel a soiree of triphop tribal jazz. Oblique saxophones, silhouetted guitar riffs, and otherworldly incantations set the groovy vibe, explored thoroughly by Sopchek in his successful quest to create a stylistically diverse yet fully integrated musical landscape. Each of MASKS' seven tracks is intended as a short documentary based on original local lore from Kenya and Tanzania. True to his vision, Sopchek conjures vivid images of fevered rituals honoring the ancients—ceremonies practiced nightly in the sacred shrines of East Africa and the West Village. Sopchek was born on 14th May 1960 in Zemun . Plays guitar since he was 14. First influence was Carlos Santana. At 18 he started playing live with well known Yugoslavian Jazz musicians like Stjepko Gut, Misha Krstic, Jovan Maljokovic, Misha Blam, Milosh Petrovic… During 1982 he played drums in Jazz trio with Misha Krstic. At that time he enrolled Academy of Fine Artsin Belgrade. Academy had at that time one of leading clubs in Belgrade where he was involved as an organizer and participant of Jazz sessions. He was also producing in his studio many at that time unknown and now established bands and musicians in all kind of music styles. In 1988 he finished his first project called "Between New Delhi & New York". Entire album was composed, produced and played by Sopchek In August 1988 he went to Canada where he made Art-Music project "Indian Summer". Also in Toronto in his own production he made several documentaries. One of them was shown on Ontario TV and another was shown at Belgrade's Festival of Documentary and Ethno Films, 2000. All content on these web pages is ©2004 FNI Multimedia/cdRoots and the individual artists. NO reproduction of text or audio is allowed without written permission.